Though US wage inflation and global growth are increasingly showing signs of life, proponents of the ‘secular stagnation’ hypothesis remain sceptical – “it is more likely that a combination of rising inequality, slow labour force and productivity growth, and greater competition from developing countries will keep private sector demand subdued”. Policy studies have supported this assessment – “the global equilibrium real rate may settle at or slightly below 1% over the medium to long term” (Rachel and Smith 2017). From a post-war perspective, the interest rate environment since the 1980s has no doubt been weakening. The purpose of this column is not to come down squarely on one of the alleged drivers – be it a debt overhang, sluggish investment demand, demographics, or an innovation dearth. A common characteristic shared by all these analyses remains the rather narrow historical frame of reference, typically relying solely on 20th century data, though notable exceptions for the 19th century exist in Hamilton et al. (2016) and Eichengreen (2015). Rather, it represents a call to take long-term economic history into account. I have previously made the case that falling global real rates are nothing new in a multi-century context (Schmelzing 2017). 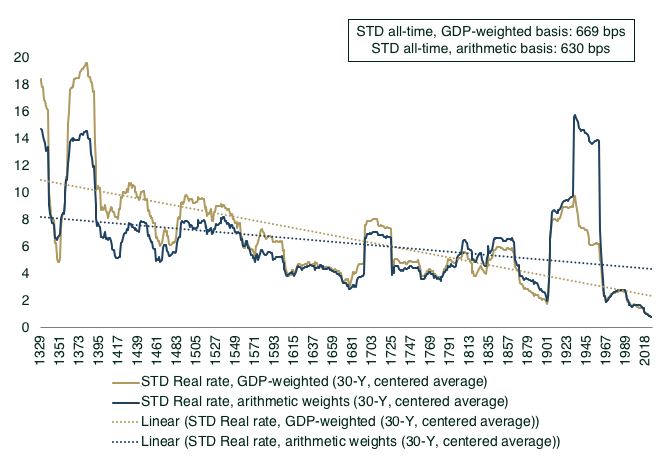 In fact, real rates have been falling for over 500 years on a variety of regression measures. One can approach the case with single country data, splicing rates for sovereign long-term bond issuers offering the most robust commitment mechanism in their respective age. The fact that this series (Schmelzing 2018) does not feature a single principal default event over time warrants its characterisation as the ‘risk-free’ rate (Figure 1). On this measure, ex post real rates averaged over 9% in the 15th century, before declining to just over 6% in the following century, until they reach 1.87% in the 20th century, and averaging 1.36% since 2000. Here, I underscore these observations by following an alternative approach, displaying annual global GDP-weighted real rate data for all advanced economy issuers for which long-term debt quotes can be obtained (see Figure 5). GDP data is partly provided by the well-known Maddison (2007) series, while bond and inflation data come from a range of historical accounts, including Allen’s (2001) price series. The latter’s silver basis, which I also GDP weigh, provides a check for debasement operations. 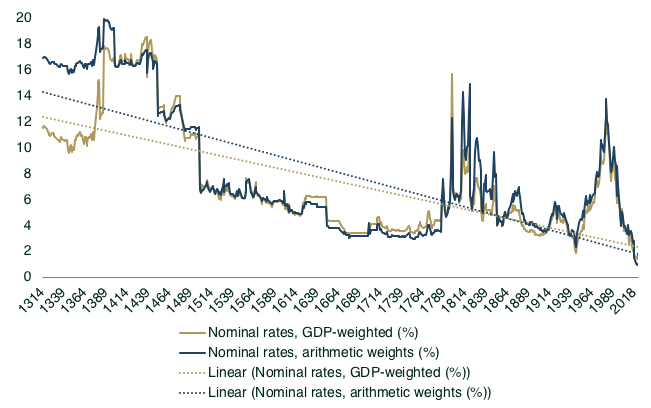 We can see from Figure 2 that double-digit nominal rates were the norm in the financial system for more than 150 years during the late middle ages, when the first secondary markets for government obligations are documented. The years of the epic ‘Bullion famine’ in the 15th century – with contemporary accounts across Europe replete with lamentations about “the insufferable scarcity of fractional money in the city and Kingdom, which may occasion great scandal and danger” (Hamilton 1936: 37) – combined high nominal rates with deflation, as trade deficits and the takeover of silver mines by the Ottomans depleted bullion reserves, and saw all time peaks in real rates close to 20%. When trade deficits with the Levant stabilised and mines were retaken by Western armies, money growth sharply rebounded (Day 1978). In modern history, notable spikes are associated with the turmoil of the Napoleonic Wars, the US civil war, Great Depression-era instability, and finally the oil shocks that ended with Paul Volcker’s ‘war on inflation’. Though more nuanced, particularly for the 19th century, the bottom line on this alternative basis remains consistent – since the peak in 1379 at 18%, the global real rate trends downwards, on average by 2.8 basis points per annum, to the current 0.75% level on US 10-year Treasuries. Real rates since the oft-cited peak of the 1980s have declined by 13.2 basis points per annum – an acceleration from the all-time speed, but by no means a unique episode for advanced economies. 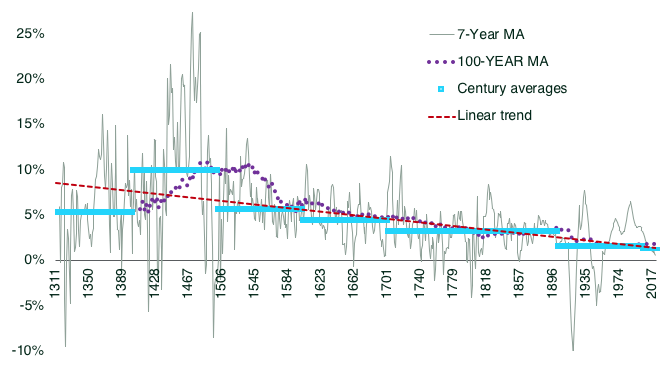 During the absolutism of Louis XIV in the second half of the 17th century, European real rates fell on average by 24 basis points; during the two decades following the Congress of Vienna, real rates fell by 33 basis points per annum; during the ‘Long Depression’ of 1875-1900, global real rates fell by an average of 14.4 basis points per annum. 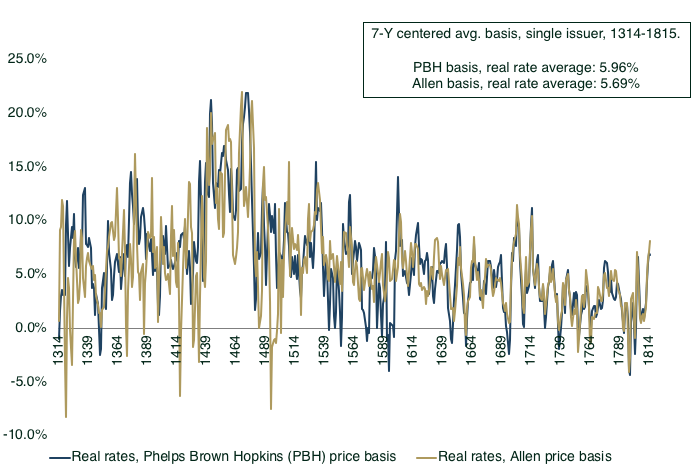 We can equally vary the price series to test robustness – prior to Allen’s (2001) CPI series, the Phelps Brown and Hopkins (1956) price index constituted a standard long-term basket, based on South England living costs. As Figure 4 confirms, the indices move closely in tandem over 1314–1815. We observe the same all-time peak in the late Quattrocento, followed by continuous real rate decline. While nominal rates in the aftermath of the 2008 recession have ‘overshot’ the trend levels implied by the steady 700-year record, and are indeed now too low against that backdrop, the actual secular outliers in 20th century interest rate history were the sharp rise at the height of the interwar Great Depression, and the oil shock-induced rate surge prior to Paul Volcker’s stabilisation in the early 1980s. Falling real interest rates, however, are themselves nothing novel. Meanwhile, the frequency of very low long-term real rates is increasing over time – I count 158 (52) individual annual instances when global real rates fell to negative levels on a GDP-weighted (single issuer) basis, of which more than a quarter (40%) are recorded since the beginning of the 20th century. In a second step, I display the standard deviation of the global real rate, here as a 30-year rolling average (Figure 3). The results are equally striking – it can be shown that the most recent standard deviation of real rates reached historical record lows over a 700-year horizon, averaging just 175 basis points since 1980. This compares to all-time levels of 669 basis points, and an average of 534 basis points since 1500. While the early volatility is unsurprising given frequent harvest failures and demographic shocks such as the Black Death, the sharp drop in volatility since the end of Bretton Woods in the long-term context appears to have initiated a singular rate volatility episode. In other words, global real rates are not just trending lower – they are also consistently becoming ‘stickier’. These results suggest that even if cyclical forces could now stabilise nominal Treasury rates beyond 3%, central bankers may find that before they have fully returned to normalised balance sheets, ‘suprasecular’ real rate trends will have caught up to them once more. Negative real rates could become a more frequent phenomenon, and indeed constitute a ‘new normal’. Absent geopolitical or natural disaster shocks – which in the past at least temporarily ‘broke’ the trend – unconventional monetary tools may (under this scenario) mature into more permanent features of the international financial system. 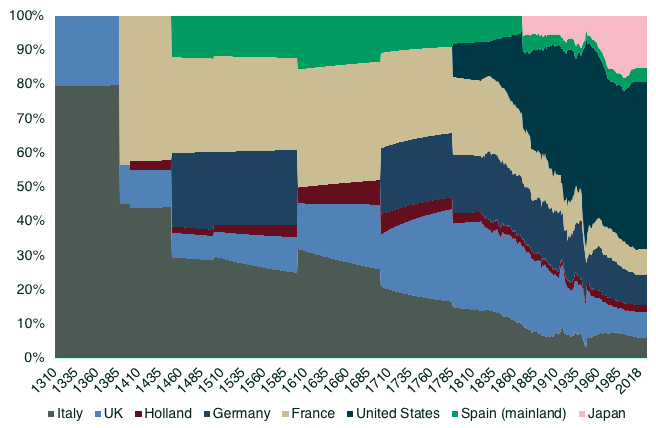 Allen, R C (2001), “The Great Divergence in European wages and prices from the Middle Ages to the First World War”, Explorations in Economic History 38: 411–47. Day, J (1978), “The Great Bullion Famine of the fifteenth century”, Past and Present 79(1): 3–54. Eichengreen, B (2015), “Secular stagnation: The long view”, American Economic Review: Papers and Proceedings 105(5): 66–70. Hamilton, J, E S Harris, J Hatzius and K D West (2016), “The equilibrium real funds rate: Past, present, and future”, IMF Economic Review 64(4): 660–707. Hamilton, E J (1936), Money, Prices, and Wages in Valencia, Aragon, and Navarre, 1351-1500, Cambridge. Homer, S and R Sylla (2005), A History of Interest Rates, New York, 4th edition. King, M and D Low (2014), “Measuring the ‘world’ real interest rate”, NBER Working paper 19887. Phelps Brown, E H and S V Hopkins (1956), “Seven centuries of the prices of consumables, compared with builders’ wage-rates”, Economica (New Series) 23(92): 296–314. Rachel, L and T Smith (2017), “Are low real interest rates here to stay?”, International Journal of Central Banking: 1–42. Schmelzing, P (2017), “Global real interest rates since 1311: Renaissance roots and rapid reversals”, Bank Underground, 6 November. Schmelzing, P (2018), “Eight centuries of the risk-free rate: Bond market reversals from the Venetians to the VAR-shock”, Bank of England, Working Paper 686 (March 2018 update). Summers, L (2018), “The threat of secular stagnation has not gone away”, Financial Times, 6 May.